1. Kerry Von Erich vs. Ric Flair, Christmas Day 1982. This match stands out to me for a couple of reasons. It features two of my all-time favorites. It's also the very first match I remember watching as a young fan. I was nine years old and the Modern Day Warrior quickly captured my attention. Michael Hayes was serving as special guest referee. Terry Gordy stood guard outside the ring. Back then the Freebirds and the Von Erich brothers were allies. That changed on this night as Kerry could have taken advantage of Flair's misfortune with Hayes, Von Erich refused. 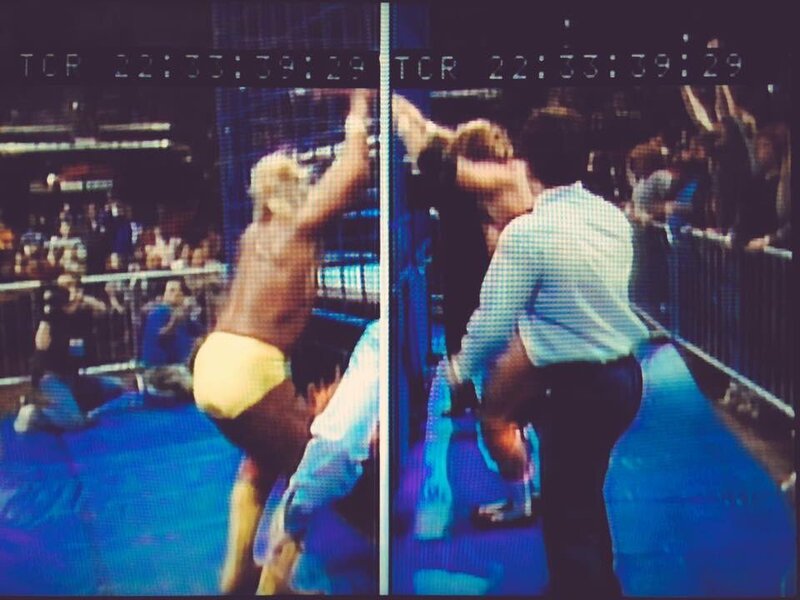 This enraged Hayes and Gordy slammed the cage door on Kerry's face. This set up Flair to get the win and started one of the greatest rivalries in pro wrestling history. 2. Hulk Hogan vs. "Mr. Wonderful" Paul Orndorff, January 1987. I was in eighth grade when this match happened on Saturday Night's Main Event. I was away for the weekend on a Boy Scout campout and could not wait to get home that Sunday afternoon to watch the show on VHS. I had been a Hulkamaniac since first seeing Hulk Hogan burst on the scene. However, in my rebellious teenage phase, I turned my back on the Hulkster and wanted "Mr. Wonderful" to win. And I thought he was going to. This is the cage match where both men dropped to the arena floor at the same time. Even in the instant replay, it was too close to call. I loved this ending but it didn't take long for the Hulkster to come back and retain the championship. 3. "Stone Cold" Steve Austin vs. Vince McMahon, February 1999. One of the hottest feuds of all-time is the Austin-McMahon rivalry. The two hated each other with a passion and put their hatred to the test inside a cage for the St. Valentine's Day Massacre event. The ending of this match is iconic too (obviously or I wouldn't be writing this). The debuting Big Show (aka Paul Wight) burst through the ring from underneath. He assaulted Austin and chucked the former champion into a wall of the cage. It came off and Austin slid to the floor to victory. It was one of the coolest finishes I can recall and it set up Big Show to be the newest monster on the WWE roster. Obvious honorable mentions include Jimmy Snuka vs. Bob Backlund when "Superfly" leaped off the top of the cage. Big Bossman vs. Hulk Hogan and the superplex Hogan delivered on SNME. And Ric Flair vs. Nikita Koloff when Dusty came in to help Flair and the Horsemen turned on him and broke his ankle. What are your favorite cage match endings? 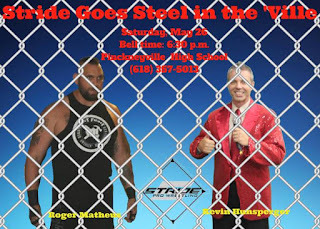 Share here and be sure to see more steel cage action this Saturday night (May 26) at Pinckneyville High School as Stride Goes Steel in the 'Ville.